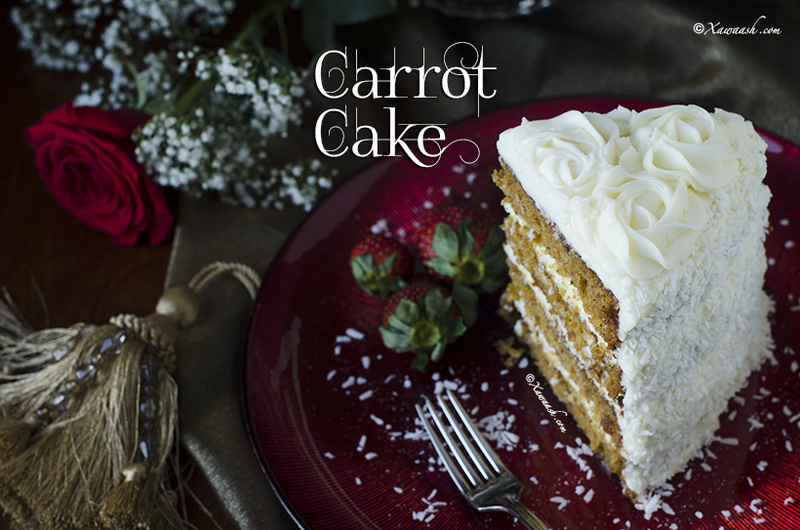 We were always very fond of carrot cake but we know several family members as well as friends who would prefer to have no cake rather than eating a carrot cake. That is until they tried this cake. When we started working on this recipe we had a few things we wanted to accomplish. 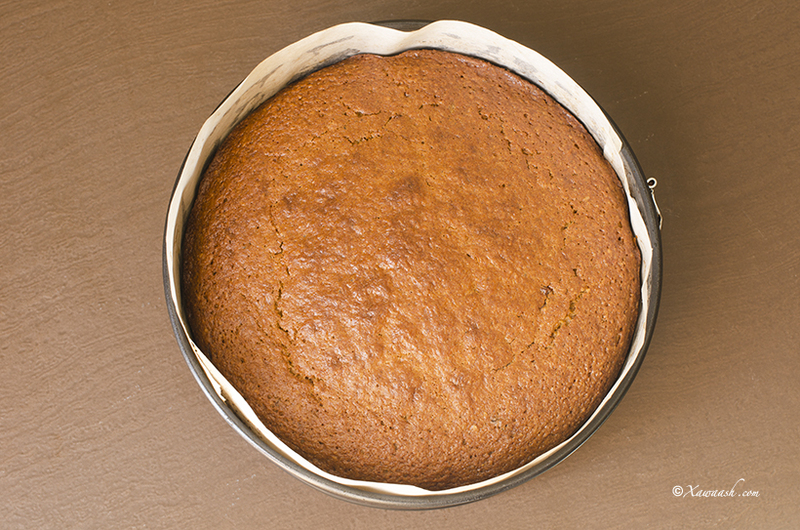 We wanted a moist cake that was less oily, less dense, and had a finer texture that would make it possible to make a clean cut into the cake. We believed we were successful on all counts and the cake was scrumptious even without frosting. The first cake we baked had no chance making it to the frosting stage. When we frosted the cake and served it to our guests, it was gone in no time. 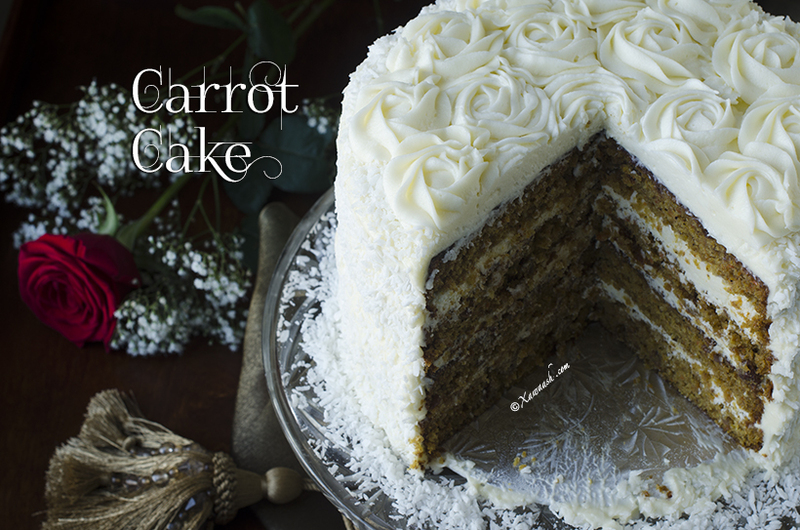 One of them decided that she would have this carrot cake as her wedding cake. That was one of the best compliments we received. Shred the carrots and then shred more finely. 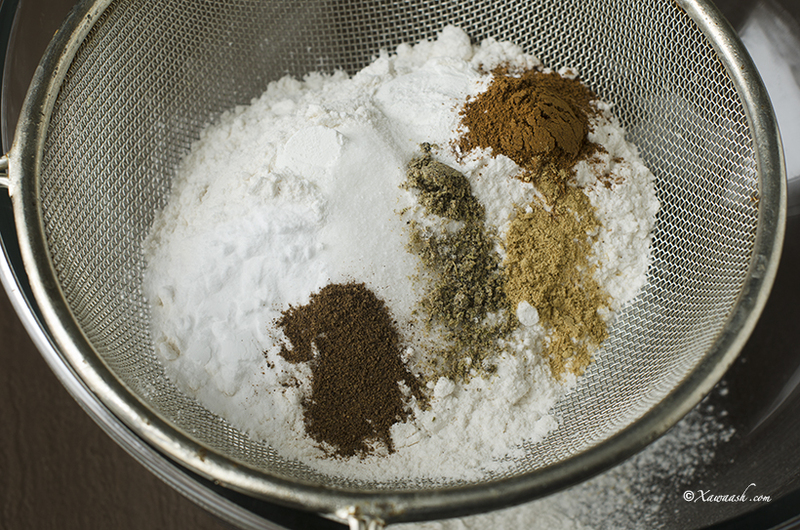 In a sieve, combine the flour, baking powder, baking soda, salt, ground cinnamon, ground cardamom, ginger powder, and ground allspice. Sieve them together. Add the chopped raisins and shredded coconuts and stir well. 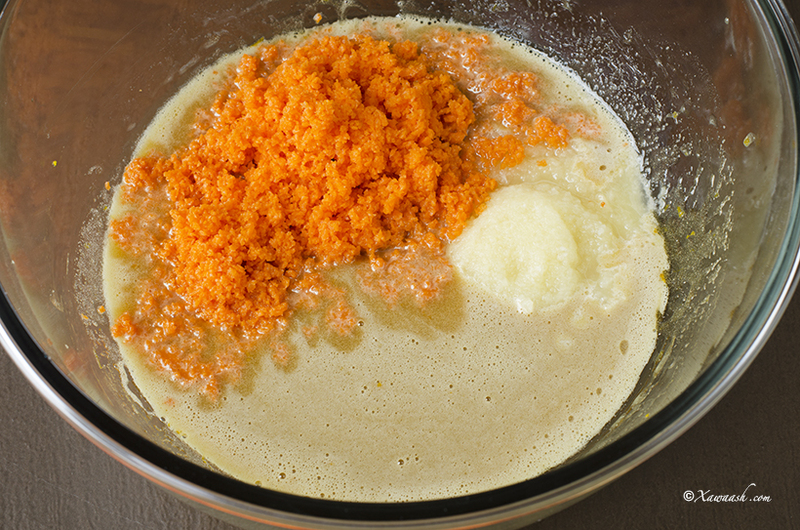 In a bowl, combine the white granulated sugar, brown sugar, vegetable oil, eggs, orange zest and vanilla extract. Drain the pineapple and blend well. 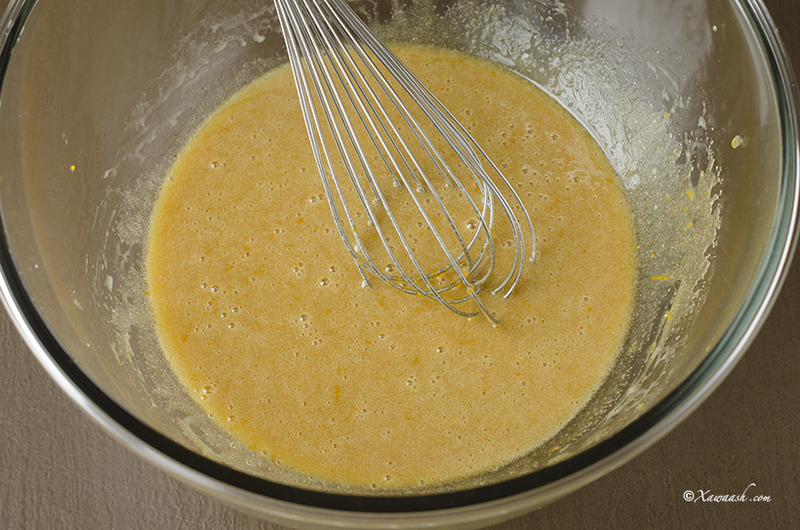 Add the blended pineapple and shredded carrots to the wet ingredients. Stir well. 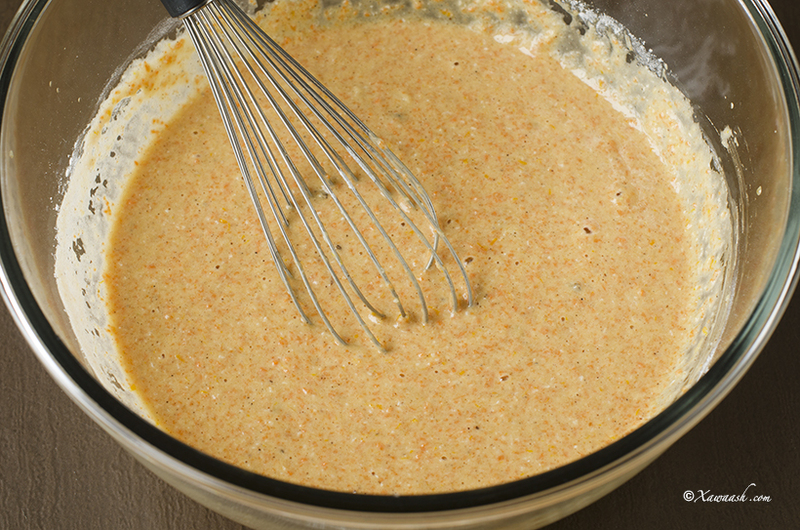 Add the dry ingredients to the wet ingredients and combine well. 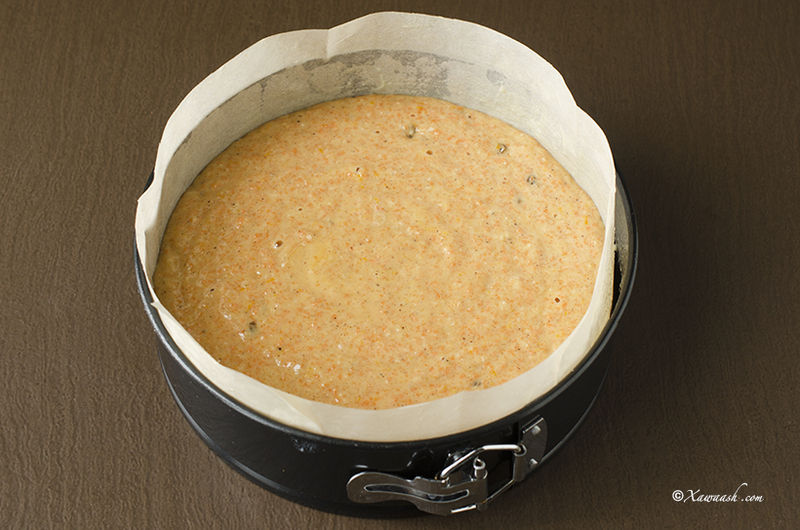 Pour the batter into a 9½” (24 cm) mould lined with parchment paper and buttered. Bake in a preheated oven at 380°F/193°C for 45 minutes. 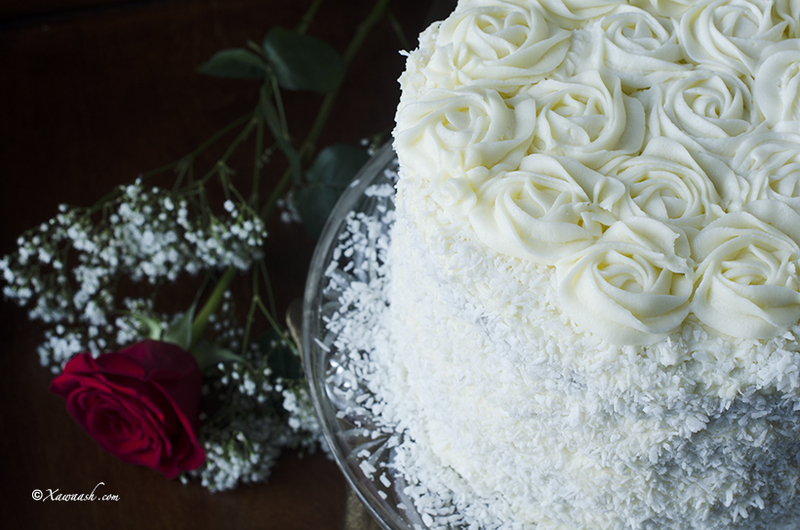 If you wish, frost with Cream Cheese Frosting. Karootada si fiican u xoq. Isku shaqshaq burka, beekin bawdarka, beekin soodaha, cusbada, qorfaha shiidan, haylka shiidan, budada sanjabiisha iyo buhaarka “allspice” oo shiidan. Ku dar sabiibka la jarjaray iyo qumbaha shiidan, kaddibna si fiican isku qas. Isku dar sokorta cad, sokorta madoow, saliidda, ukunta, bishirka oranjada iyo faniillada, kaddibna si fiican u qas. Cananaaska biyaha ka miir, kaddibna si fiican u shiid. Mukawinaadka qoyan ku dar cananaaska shiidan iyo karootada xoqan, iskuna qas. Mukawinaadka qalalan iyo kuwa qoyan isku dar, kaddibna si fiican u qas. Cajiinka ku shub bir doolsho 9½” (24 cm) oo xaanshi foorno la saaray kaddibna burcad (buuro) la mariyay. Ku dub foorno la sii kululeeyay 380°F/193°C muddo 45 daqiiqo. Haddaad rabtid mari Kareemo Farmaajada. 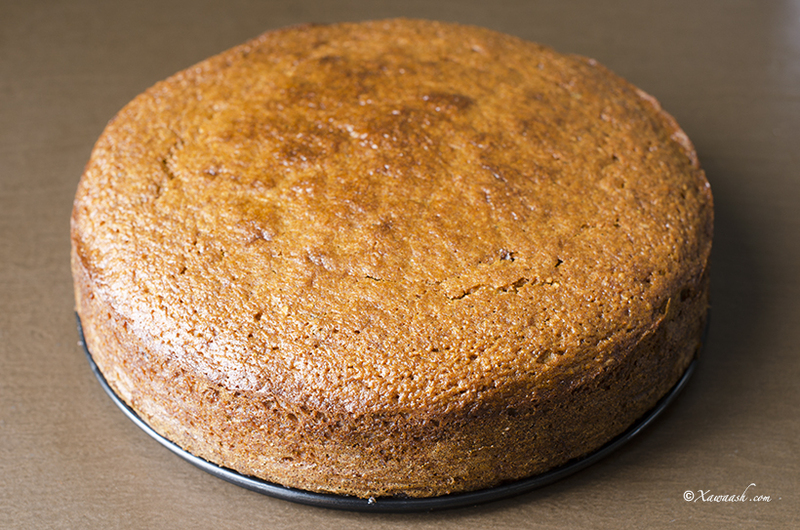 Nous avons toujours apprécié le gâteau à la carotte mais nous savons que certains parents et amis préféreraient se passer de gâteau entièrement plutôt que de manger du gâteau à la carotte. Mais ça c’était avant qu’ils ne goûtent notre gâteau. Quand nous avons commencé à travailler sur cette recette nous nous sommes fixés des objectifs à accomplir. Nous voulions un gâteau moelleux mais moins gras et moins dense, qui aurait une texture plus fine qui permettrait de le découper proprement. Nous pensons avoir réussi sur tous les points et le gâteau que nous avons obtenu était délicieux même sans glaçage. Notre premier gâteau n’a pas tenu assez longtemps pour atteindre l’étape du glaçage de toute façon. Quand nous avons fait un gâteau à la carotte avec un glaçage et l’avons servi à nos invités, il est parti en un rien de temps. L’une d’eux a même décidé qu’elle servirait ce gâteau à la carotte pour son gâteau de mariage. Ce fut l’un des plus beaux compliments que nous avons reçu. Râper les carottes puis les râper à nouveau plus fin. Mélanger la farine, la levure, le bicarbonate, le sel, la cannelle moulue, le cardamome moulue, le gingembre en poudre, et la poudre de quatre-épices. Tamiser les ingrédients. 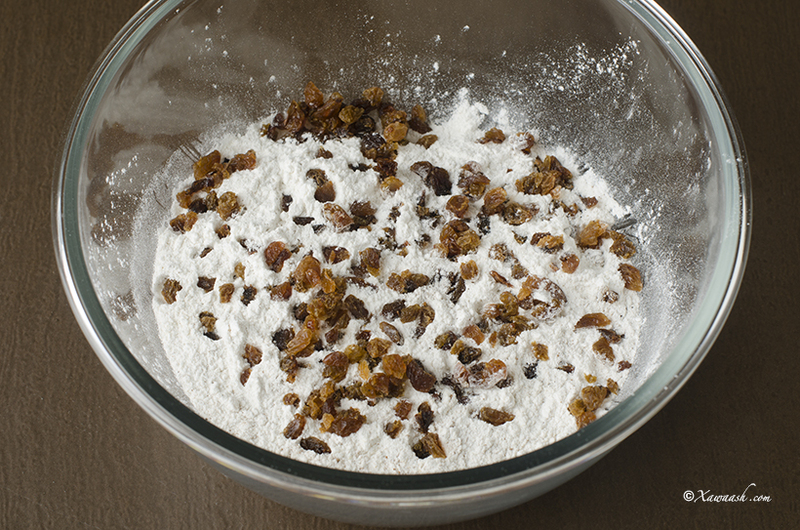 Ajouter les raisins secs hachés et la noix de coco râpée et bien mélanger. 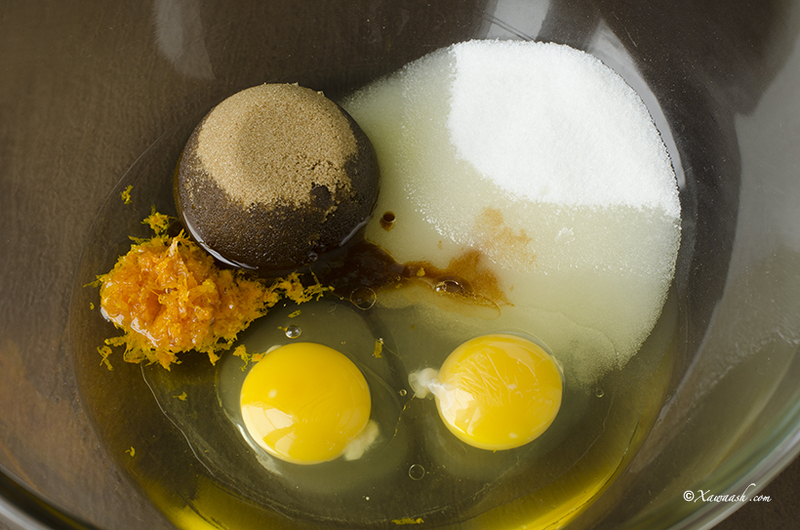 Dans un bol, mélanger le sucre en poudre, la cassonade, l’huile, les oeufs, le zest d’orange et l’extrait de vanille. Égoutter l’ananas et mixer. 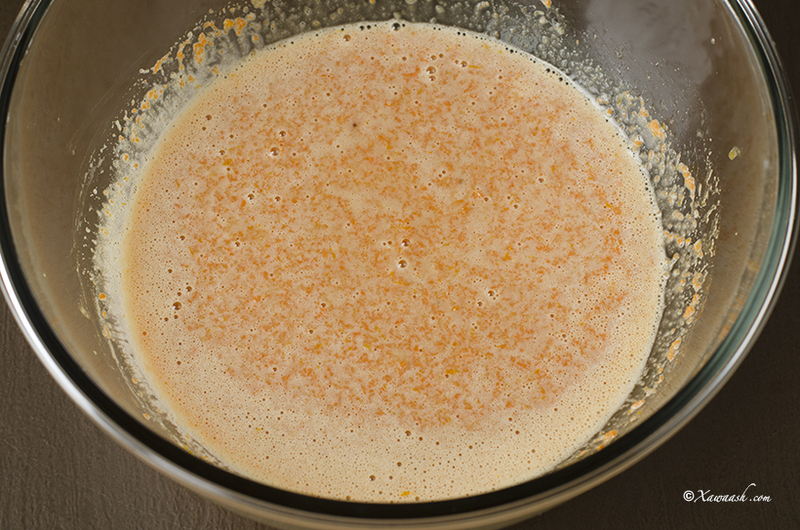 Ajouter l’ananas mixé et les carottes râpées aux ingrédients liquides. Bien mélanger. Verser la pâte dans un un moule de 9 ½ “ (24 cm) tapissé de papier cuisson et beurré. Cuire 45 minutes au four préchauffé à 380°F/193°C. Si vous le souhaitez, recouvrir de Glaçage au Cream Cheese. 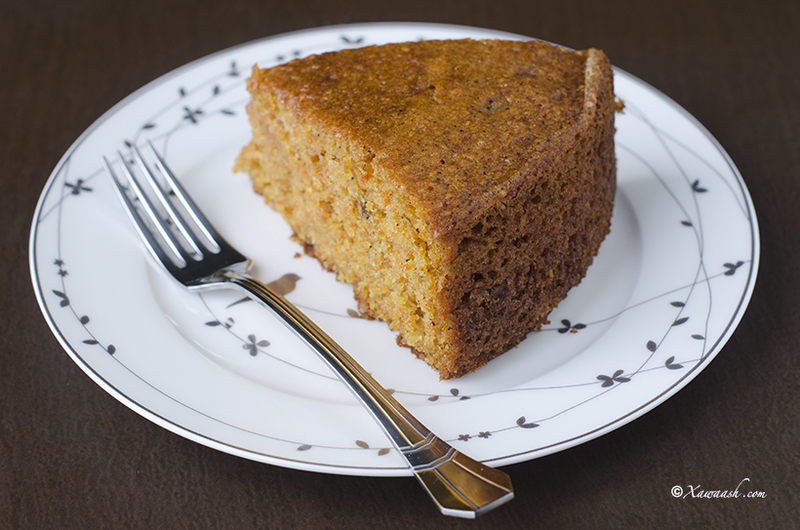 Thank you so much for posting another wonderful recipe, I love carrot cake to bits and you guys make cooking a whole lot easier ….I check out your website very often, thank you for all the hard you guys put into making and maintaining this website and may Allah subhaana wata alah bless you both for your efforts ameen. I am a newbie to your food blog and luv luv your recipes. In fact I have few blogs I must check on everyday and Xawaash is one of them. I luv the clear instructions thru pics, videos and transcript. Gosh the effort. I luv that u hv made it easy by giving metric measures which I use. Wld u say, the eggs measure round 60g each. 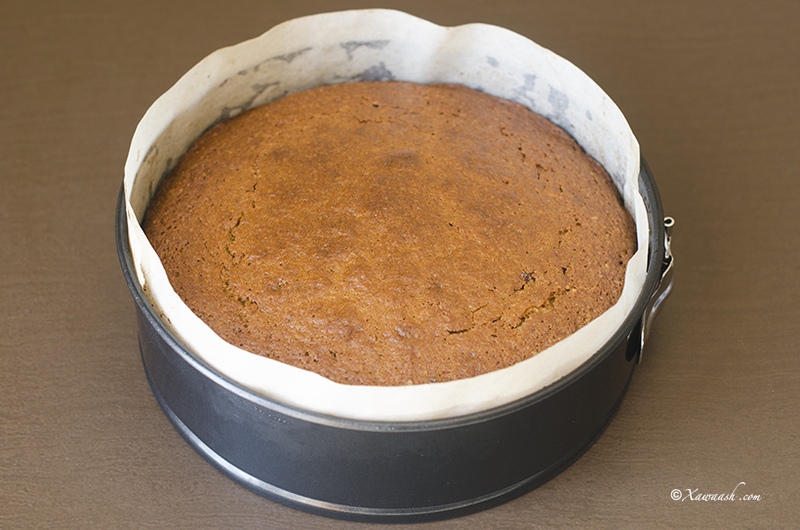 I luv carrot cake and this recipe is the first one I want to start with, from your lovely blog. Thank you very much for the lovely comment. We appreciate you taking the time to write it. In our recipes, we use large eggs and on average they weigh 50 grams each. We will include that information the next time we use eggs in our recipes. 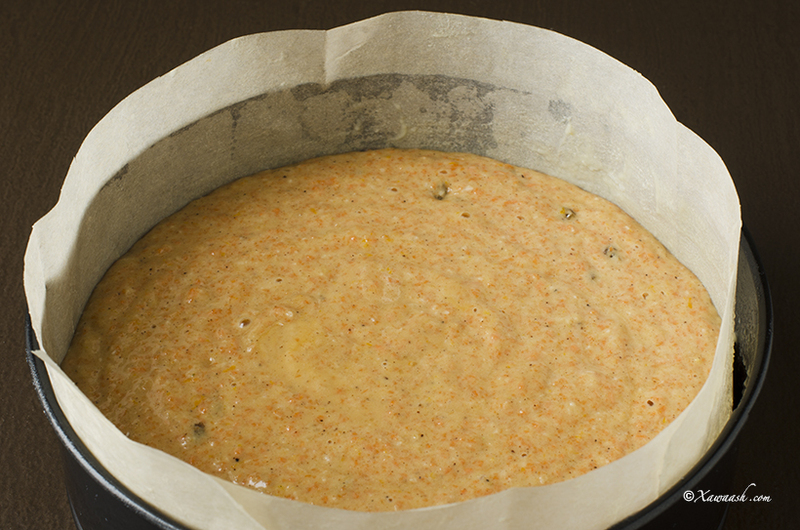 We hope you will like the carrot cake once you bake it. We will be posting the recipe for the cream cheese frosting soon, but in the meantime you can click on the link in the carrot cake video to watch the video for the frosting. We will post a recipe for hot cross buns (who doesn’t love them?) but it is such a short notice. The good news is that the recipe we have in store will be well worth the wait. Happy Easter! Walaalo waad mahadsan tihin. manshalah, caka aad iyo aadka u quruxda badan ee aad no soo galisen, Ilahy waxaan had iyo jeer idinka baryaa cafimaad iyo cimrii dheer cibaado san. waxad tihiin laba rux oo aad iyo u( Qali ah) oo jecel in ay bulshada wax wanagsan uso bandhigan markasta. aad ayan idinku mahad naqaya wakhtigina wacan ee aad noo hurten,xasanad badana Ale ha idin siyo Amin.Idinka iyo caruurtina iyo walidiintii sida fican idin soo barbariyay.Ilahay ha idn xafido. Mahadsanid walaasheenna qaaliga ah. Aad iyo aad ayaan ugu faraxnay xiriiriskaada iyo hadalada wacan aad inoo soo qortay. Qayr ayaan kuu rajaynaynaa adiga iyo reerkaada. Mahadsanid mar labaad. I discovered your blog by accident and believe it or not it’s one of my favourite food blogs. I have tried several of your recipes and they have turned out really good.I really appreciate your efforts in making the recipes easier for people who are new to cooking. 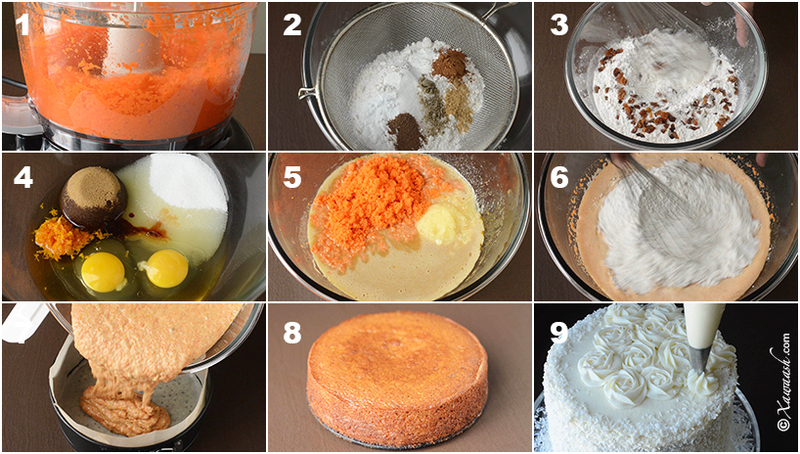 I am gonna try this carrot cake recipe for the next weekend. Thank you very much for taking the time to comment. We are so glad you have found us, and happy to hear that our recipes are working for you. 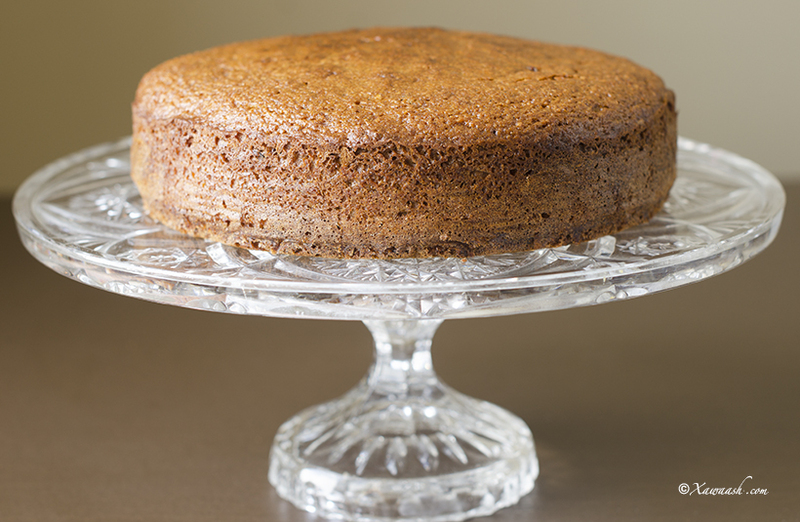 This carrot cake is one of our favourite cakes. We made it for a family gathering everyone loved it, including our 4 year old niece; she even asked for a second piece. We wish all the best. 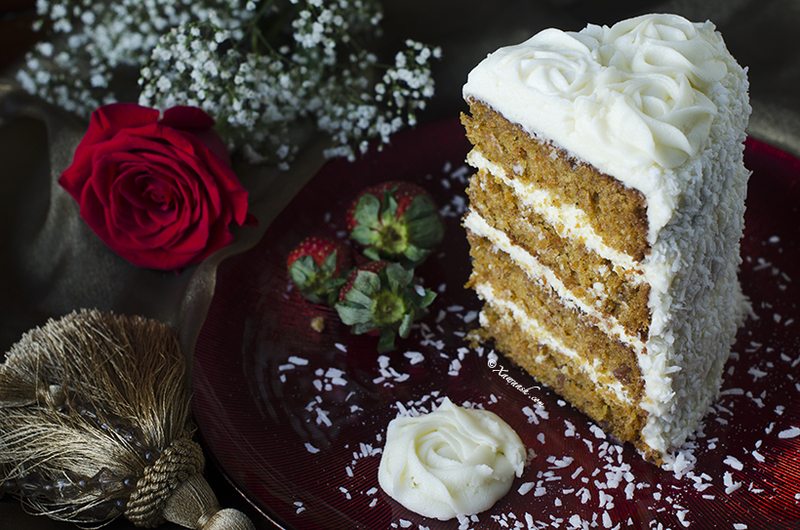 looks like a gorgeous carrot cake! Thank you very much. Ramadan Kareem. Midkaan isku day http://xawaash.com/?p=7725. Waxaan rajaynaynaa inuu kuu sahlanaado. 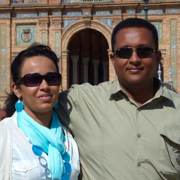 Shukran Leila & Abdullahi sida aad marwalba ugu dadaashaan inaad bulshada wax wanaagsan usoo gudbisaan, waxaan idiinka codsanaa sida cream cheese frosting aad u diyaariseen inaad noo soo gudbisaan. Markale aad ayaan idiinku bogaadina shaqada wanaagsan ee aad bulshada u haysaan. Waa ku mahadsan tahay hadalada wacan. Soo’da waa tan http://xawaash.com/?p=7949.